Zebra grip pen writes incredibly well. A quality pen with a great reputation and excellent budget too. Truly our favorite grip pen. Call the experts at 888-332-ADCO for the best promotional pens andunder a dollar gift advice. 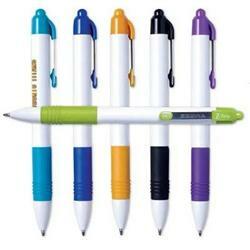 This great Zebra pen has a sturdy metal clip and comes in several great accented color options.? A good feeling plunger action retractable ballpoint pen with the standard smooth writing feel you're used to from Zebra, this pen is a great inexpensive giveaway for any event! Available Colors: Light Blue, Royal Blue, Yellow, Black, Purple and Green accents on solid white barrel. Production Times Available: 5 business days standard. Typical Imprint Area(s): 1 1/8" x 1/2". White barrel with colored accents and metal clip. 1000 pieces per box, 20 lbs per box.